This fall semester UH Special Collections hosted Edward Lukasek and Dr. Natalie Houston in a panel discussion, “Life With Books: Collecting, Reading, and Teaching LGBTQI Literature.” If you could not make the event or if you would like to remember that very special conversation, please enjoy the recently published video below courtesy of University of Houston Libraries. In addition to the over 7,000 linear feet of archival collections made available for study at the University of Houston Special Collections, we are also proud to offer over 100,000 rare and antique books for use in our reading room. Each month we highlight a text from our collections and what makes it so special. 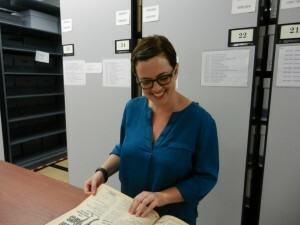 This month’s selection is contributed by Library Specialist for Liaison Services and Curator for the new Unique Holdings brown bag lecture series, Kristine Greive. “All A Mockery,” from George Ade’s Fables in Slang, illustrated by Clyde J. Newman. Read a few of Ade’s fables and you’ll join a group of admirers that stretches back over a hundred years. 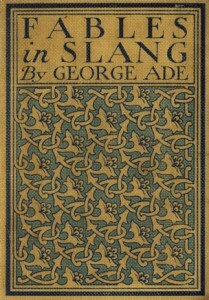 Ade was enormously popular in the early twentieth century; in fact, the advertisement for his other books in the back of Fables in Slang asserts that “Mr. 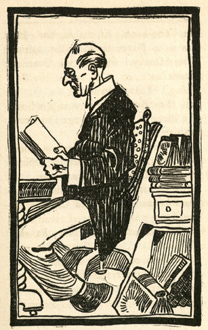 Ade’s books are too well known to require comment here.” He had influential fans, too: Taft held his first presidential campaign rally at Ade’s home, and Theodore Dreiser so admired Ade’s gift for description he even lifted a passage from his fables for use in the original edition of Sister Carrie. In his book on Ade, Lee Coyle locates a passage in the letters of Sir Walter Alexander Raleigh calling Ade “the greatest living American writer, ” an assertion that, while controversial even then, illustrates the name recognition Ade enjoyed in his time. 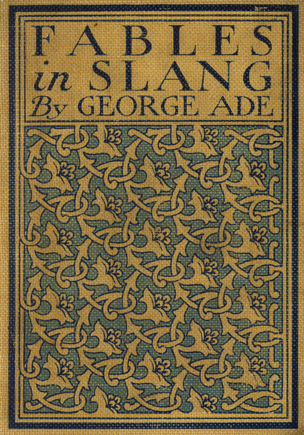 He may not be as well known today, but Ade is forever being rediscovered, with periodic new editions of his works. Fables in Slang was also recently discussed in The Last Untapped Resource in Houston, the first brown bag lecture in the Unique Holdings series highlighting rare books in our collection. The next event is April 22 and will feature life science books, ranging from centuries old illustrations of mythological animals to contemporary fine press books. In the meantime, why not come to the Special Collections Reading Room and read some fables? Just ask for call number PS1006.A6 F3 1900. M.D. Anderson Library has grown with the University of Houston, and its modest original building has been enlarged several times as needs have changed. Within these additions it is still possible to see evidence of the library’s 1970s master plan, only part of which was carried out. At the building’s core is the original structure opened in 1950, a conservative modernist design by Staub and Rather. Clad in the white limestone of the university’s original buildings, the library harmonized with the nearby Ezekiel Cullen building without upstaging it. When the original library building, known today as the Red Wing, became inadequate, the university responded by adding a large eight-story tower (the Blue Wing), completed in 1968. Designed by Staub, Rather and Howze, the tower housed the research collections and study carrels necessary to support the university’s graduate degree programs. Despite this impressive addition, the university’s growth made further library expansion inevitable. In 1975 administrators retained Kenneth Bentsen (UH 1952), architect for Agnes Arnold Hall (1968) and Philip G. Hoffman Hall (1974), to prepare a master plan that would guide this expansion. Bentsen proposed to enlarge the library’s main building substantially in three phases over a ten-year period. The first phase would include a five-story wing on the north side of the building and a new black-glass façade that would house a lobby and lounge area. This addition (the Brown Wing) was completed in 1978 according to Bentsen’s design. Phase Two would add a matching five-story wing on the south side. When more space was needed, a third phase would add two more floors to the north and south wings. 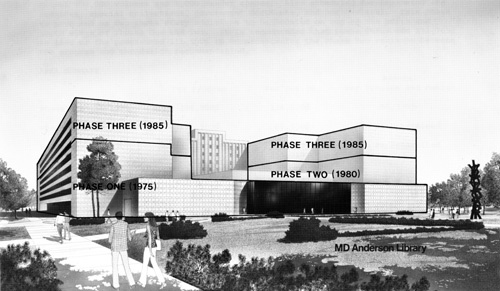 Bentsen projected that this three-stage expansion might be completed by the end of the 1980s. That decade brought a major recession in the energy industry, which devastated the Texas economy. State government funding for building projects dried up, and the university was unable to continue with the proposed library additions. When planning for a major library expansion resumed in the late 1990s, the architects Shepley, Bulfinch, Richardson and Abbott followed Bentsen’s general idea for a large wing on the south side while renovating the main entrance with a new façade inspired by the Ezekiel Cullen building. 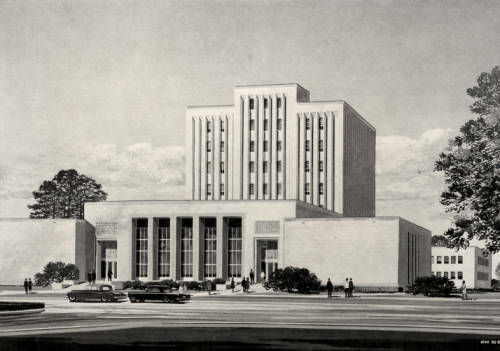 The library’s 1975 master plan has been forgotten, but some of its ideas lived on. The Kenneth E. Bentsen Architectural Papers are housed in the library’s Special Collections Department and are currently being processed. Pictures of the M.D. 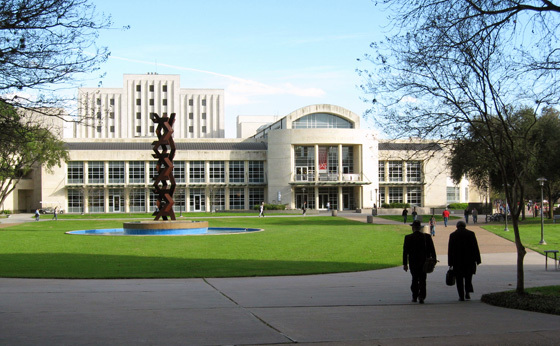 Anderson Library and other campus buildings are available in the University of Houston Buildings Collection of the UH Digital Library. Students in the Archival Practice and Organizational Histories course meeting in the Evans Room of Special Collections. 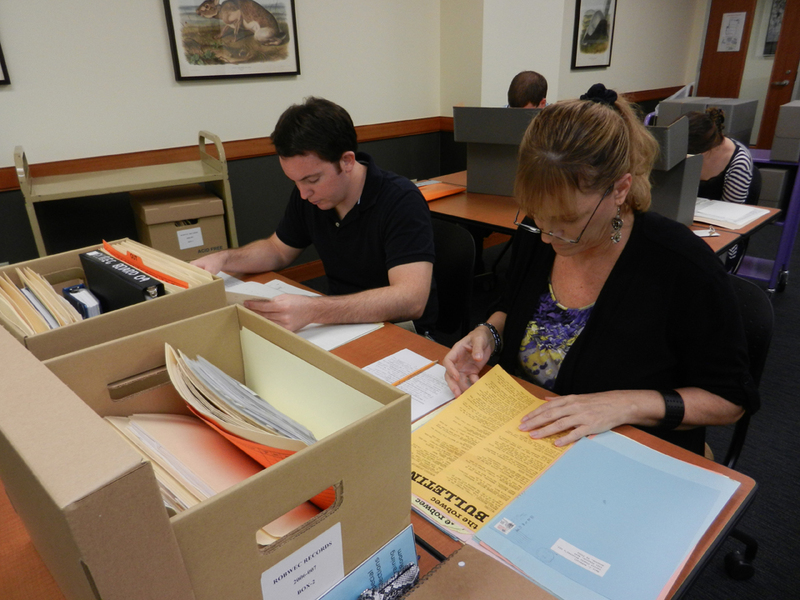 The UH Public History Program prepares graduate students interested in history for positions in various historical venues, government agencies, business enterprises, and educational institutions. 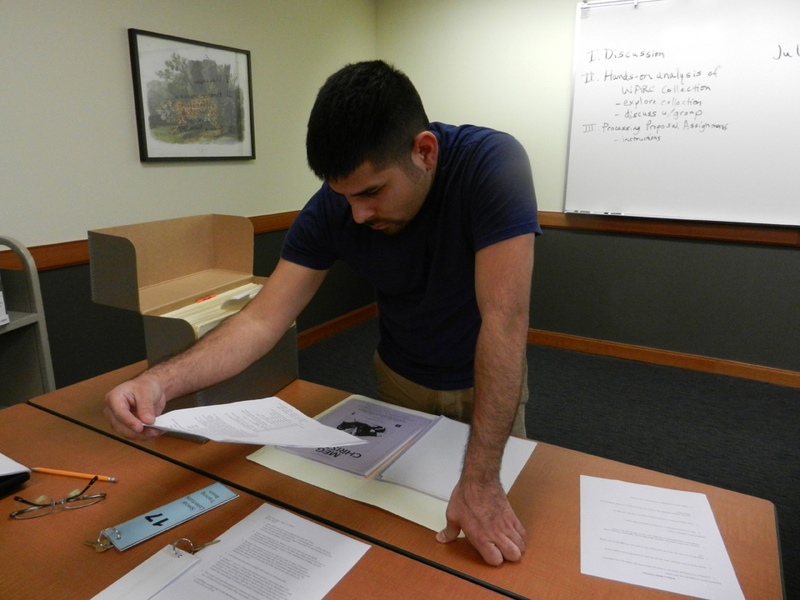 This fall, students enrolled in Dr. Kairn Klieman’s course “Archival Practice and Organizational Histories” spent three weeks immersed in the theory behind archives and the work of professional archivists. Coordinator for Instruction Julie Grob welcomed the students to Special Collections, where they focused their learning on the fascinating collections that make make up the Carey C. Shuart Women’s Archive & Research Collection (WARC). 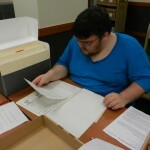 The goal of the unit was to encourage students to consider archives as a potential career, introduce them to the riches of WARC, and lead them to understand how archivists and institutions make collecting decisions which may perpetuate the dominant narrative or fill in gaps in the historical record. Student working with the Hispanic Women in Leadership Records. Students in the course read a variety of journal articles about archival theory and practice, attended lectures and discussions led by Grob, toured Special Collections, and completed a project in which they arranged a photocopied version of an archival collection in order to duplicate the work on an archivist. 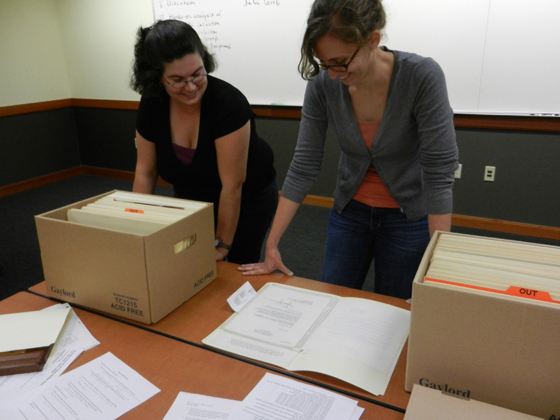 Their favorite activity was probably exploring some of the WARC archival collections related to local organizations such as the Hispanic Women in Leadership Records, Women in Action Records, and Women in the Visual and Literary Arts Records. One pair of students was excited to find correspondence between the Houston Council of Texas Garden Clubs and (then Senator) Lyndon B. Johnson, related to an environmental cause. Students also enjoyed a visit from Vince Lee, curator for WARC, who spoke to the class about his background and career path to the field of archives, and his work with donors and incoming collections. The course was also open to advanced undergraduate students, one of whom is pictured here. 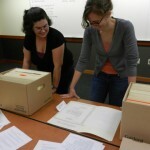 Following the archives unit, the students went on to work extensively with the local nonprofit Voices Breaking Boundaries, recording oral histories and writing an organizational history to document the organization. The records of Voices Breaking Boundaries, and the oral histories created by Dr. Kairn’s students, will be added to WARC. If you are interested in exploring the collections yourself, you may visit the WARC website to view finding aids (guides to the collections) and digital collections, or stop by Special Collections during our open hours. If you are a faculty member interested in having a unit developed around archival practice or our primary source collections, please e-mail Julie Grob. 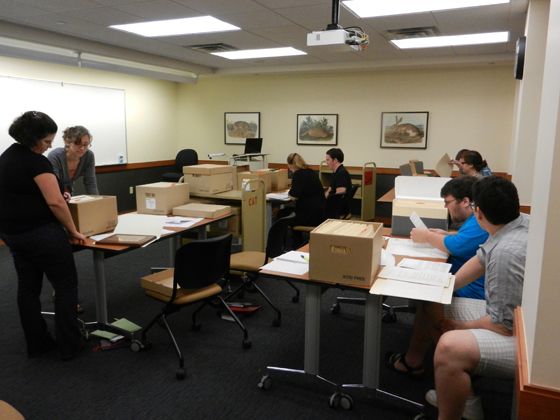 Students looking through a box of documents from the River Oaks Business Women’s Exchange Club Records. 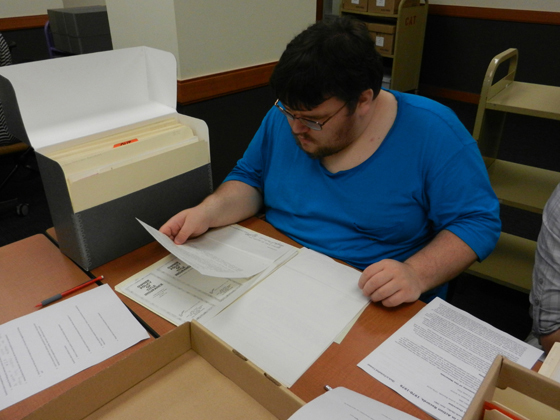 Student filling out analysis worksheet related to a collection in the Carey C. Shuart Women’s Archive and Research Collection. This pair of students found an unexpected treasure in the Houston Council of Texas Garden Clubs, Inc., Records, which led them on a quick research quest. At work in the stacks. 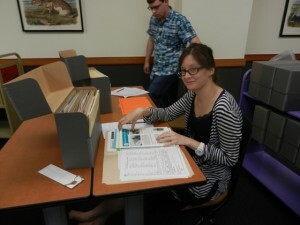 We welcome Sara Craig to the University of Houston Special Collections, University Archives team. This fall semester the University of Houston Special Collections added a new member, Sara Craig, to our team. In the role of University Archives Student Assistant, Sara works part-time supporting the needs of the University Archives as well as other archival collections, assisting with reference questions, updating finding aids, assisting with collection management and shelving, accessioning materials, and helping to arrange and describe new collections. Originally from South Carolina, Sara has studied engineering at the University of Southern California, and holds an Associate Degree in Library Information Technology. An art major here at the University of Houston, Sara enjoys working with her hands and looks forward to pursuing further education that will allow her to pursue a career in book repair and conservation. It may be in her genes. With a horticulturist mother and a father working in cabinetry and furniture-making, Sara remembers, “I was the only four-year old girl I knew with a toolbox and a garden plot.” With that upbringing and a hands-on-DIY ethos, Sara meets the day-to-day surprises and challenges of working in the archives with aplomb. In her brief time here, she has already contributed to the publication of several finding aids such as the Minnie Fisher Cunningham: McArthur-Smith Research Papers, assisted with a collections shift in the archival stacks, rehoused oversized historical materials from the KUHF Collection, and co-curated the “UH Homecoming Through the Years” online exhibition. 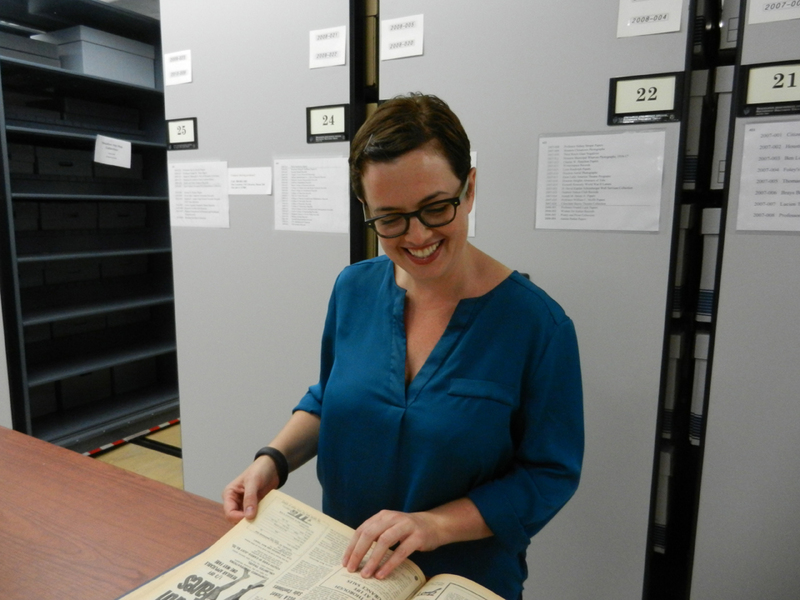 We look forward to Sara’s continued expertise, insight, and support as the University Archives and Special Collections seek new ways to assist our patrons in their day-to-day research.